The key to achieving personal finance goals is keeping the focus on what you can control. A cloud of temptation to set a bar high and getting a burnout along the way lingers on many newbies. Its not bad being excited about taking charge of our finances, as long as we bear our limitations in mind. In my previous post I documented My main goal this year as growing our net worth by 25%. I cant control anything about this goal as is. However, I can break it down into smaller parts that I can measure. The first and most important control piece is LIVING BELOW MY MEANS. I can fully control my expenditure and that's where my focus should be. Most people shiver at the mention of the word "BUDGET". I, myself never sit down and plan my expenditure prior to the actual shopping trips. I am too lazy to do that. I track every cent I spend though. I no longer find that tedious. Keyword is "no longer" because it was not always easy to track and record every cent I spend. I no longer find it overwhelming, as I simplified my expenditure tracking system over the years. I also do this the old fashion excel spreadsheet way. I avoid withdrawing and using cash so as to keep the records in my internet banking statement. That way I don't have to keep individual receipts. When I do withdraw, I never bother to record what I used cash for. I usually have some of that cash roll over to the following month when I actually do withdraw. I then use it for buying an odd burger, juice, tea, etc. My expenditure tracking system keeps me on my toes. I know that whatever I spend on is finally making its way to my spreadsheet and seeing it in black and white is always sure to raise my brow. When I do get to have bad months, like school fees months, I am sure to have a much better spend month next. Its always in my head to improve after a bad month. In December I had to spend a lot of money to help boost my online business. It felt so bad to spend 102% of my income. This was followed by our holiday in January. And holiday months are usually the worst. But my December's overspend was singing a loud hum in my mind that I passed all the bold red "SALE" signs in the malls and focused on stationery shops. Budgeting can only make you better at this. 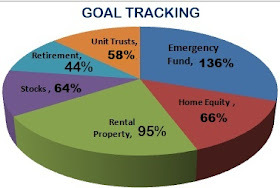 See how the BUDGET ties into our main goal of growing the net worth by at least 25 percent? We will strive to live on at most 60% of our combined income. 40% will be invested to make more money. I know, 60% sounds high (or is it just me). 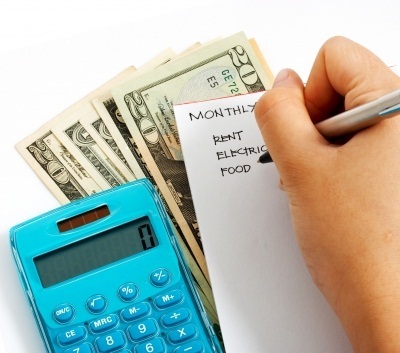 All expenses on the rental properties, like rates, taxes, management and maintenance are part of our expenditure. I should look at keeping that separate in order to account for my own residential property separately. I might just do that. This 60:40 goal is easier to measure than the huge goal of building on net worth. Always remember to focus on what you can control and measure whilst you keep your overall goal in mind. That huge goal is just a driver to help you intensify on what you are measuring. 2013 is still as young as dawn. Its time to make a clean start. If you have some debt, focus on paying it up, one credit card at a time. Its easier than you think. It may be overwhelming at first but you get to find your rhythm. And when you do, there's no stopping you. I wish you well this year. Whatever your goal. Just focus on what you can control.